Take 1-3 capsule daily with water. The product should not be taken with a meal containing raw egg whites, which may inhibit biotin’s absorption. 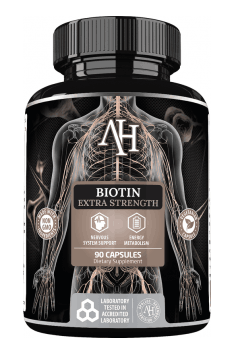 In studies evaluating the effect of biotin supplementation on the reduction of MS symptoms, the subjects received doses of 100-300 mg. Therefore it is recommended to start the supplementation 1 capsule and, if necessary, increase to 3 capsules a day. The preparation should not be taken with a meal containing raw egg whites, due to the content of avidin – a protein that has a high affinity for biotin, preventing its absorption by the body. In small amounts, biotin can be synthesized by intestinal bacteria. However, in the case of antibiotic therapy, the composition of the intestinal flora is changed and there may be a decrease in the production of biotin, leading to a deficiency.